568 Springburn Road, Springburn, Glasgow. The Stag Inn. circa 1930s. The Stag Inn was one of Springburn's oldest public houses dating back to the 1870's. 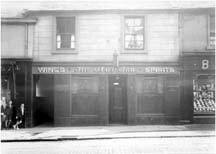 In 1875 the landlord was John Reid, another well known Springburn character and spirit merchant to own this old pub was James Lindsay, he lived at the Avenue, Balgray Cottage, Springburn. In 1887 John Warnock took over this popular Springburn tavern. Mr Warnock was born in 1855 and was born into the licensed trade, his father had pubs in the Saltmarket and Duke Street in the 1860s. John worked in the pubs during the summer holidays and never intended to go into that trade. He learned the trade of a sanitary engineer and worked in Paisley and England. John got married and had a family of two sons and five daughters, one of his sons emigrated to Dunedin, New Zealand and the other lived in London. John added other pubs to his growing business, he has licensed premises on Great Eastern Road now the Gallowgate, Rose Street, Ardgowan Street and Parliamentary Road. On the 26th June 1929 John and his wife celebrated their golden wedding at the Grosvenor Restaurant with their large family, his son traveled all the way from New Zealand while the other traveled from London, only one of their daughter's were absent as she could not travel from Ireland. The family gifted their mother with a gold wristlet watch studded with diamonds and to their father a solid gold and inscribed pair of sleeve links. In John's early days he was a keen rower, he became a life member of the Scottish Wine & Spirit Merchant's Benevolent Institution and a member of the Cowlairs Ward. His chief interest was in football, he was a member of the committee of the Celtic Football Club and continued until the club became a limited company. He was also one of the oldest members of the Kareless Klub, founded in 1886, this friendly trade orginisation of chosen good fellows which had a limited membership to around thirteen. The following year 1930, John died at his home 5 Belmont Street, Springburn, aged 75 years. The Pub was renamed to the Locomotive. Original members of the Kareless Klub. 1886. Left to right front row, Robert Anderson, he held licensed premises in the Springburn area, Alexander Graham, had pubs on Cathedral Street, Crown Street, The Club Bar, Oxford Street and the Central Bar, Argyle Street, Thomas Kerr, (the first president,) he was born in Tollcross in the year 1833, he had pubs on Trongate, South Wellington Street and the One Hundredth Bar, Crown Street, Alexander McLeod, owned the Gordon Bar, Eglinton Street, Henderson Street and Cheapside Street, John Walker, owned the famous Kelvin Bar on Cowcaddens which was later called the Variety Bar. Second row Andrew Innes, was a Greenock Licensee, William G Lang, was one of three brothers who started business in 1861 at Oswald Street and founded the firm of Lang Brothers, Duncan Porter, owned a pub in Centre Street, his son Thomas C Porter owned the Golf Hotel, Aberlady, James Craig, Alexander McIntosh, had pubs on Cambridge Street and Findlay Street, Back row James Crawford, owned a pub on Broad Street, William Graham owned pubs on James Street, Paterson Street and Nithsdale Road, this pub is known as Samuel Dow's and Andrew Kerr, was the brother of Thomas Kerr, he had pubs at 11 Crown Street and 24 Thistle Street.